Don't get me wrong - PSC is extremely close to being excellent. Playing the game as a squad commander in a company of space mercs, the goal of the game is to loot an endless battlefield full of alien-infested spacewrecks in order to ultimately retrieve the co-ordinates of a lost Mothership bursting with enough wealth to set you up for life. 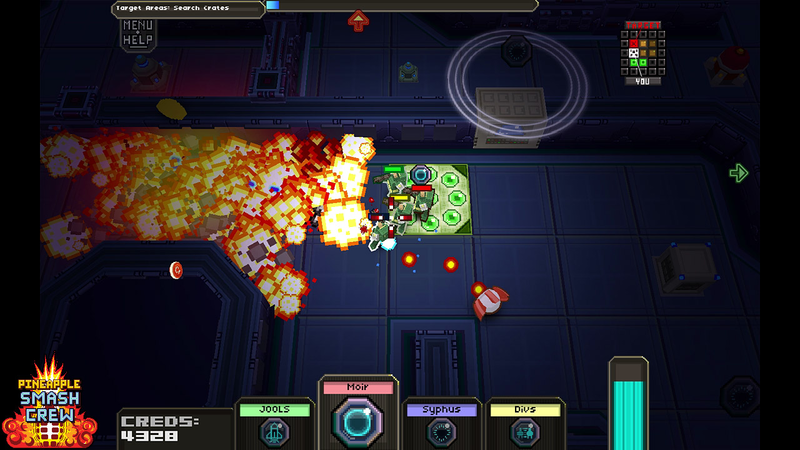 Controlled by an intuitive WASD and mouse configuration, you move through each module of the wrecks and essentially blast everything using your standard laser cannons and a wide variety of 'lobbable' weapons, grabbing as much loot as you can carry. Normally in shoot 'em ups it's the primary weapons that take precedence, but PSC is all about those lesser used hand-thrown projectiles, in particular the titular 'pin-and-pineapple' grenade. Normally added to games in limited quantities as a way of removing obstacles or reducing a boss enemy's health, in PSC grenades are plentiful, varied and without a doubt the star of the show. Starting with an arsenal limited to standard grenades and missiles, by successfully looting wrecks you'll soon gain enough experience points to unlock new types of thrown weaponry, ranging from gun turrets, health fields, teleporters, bullet bursts, black holes and numerous other weird and wonderful toys. At the beginning of each skirmish you are presented with your four mercenaries - the original squad of which you can actually rename - and if they survive (and collect enough loot) they are rewarded with a promotion, a new armour skin and strength increase. This does create some sort of personal attachment to your troops, but unlike the clearly influential Cannon Fodder there is no poignant graveyard showing the tombstones of your fallen heroes and thus they are soon forgotten. So when my initial team of Stylus, O'Toole, Uglifruit and Mr. Dennis ate spacedust I didn't really care who else fell during battle after them. 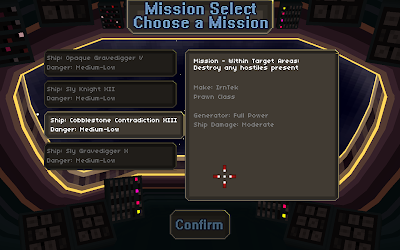 After this brief introduction it's on to making your choice of spacewreck to salvage - each of which has it's own risk value, size or class and mission type (kill everything in certain areas, find a number or artifacts or move all the toxic containers into decontamination units). 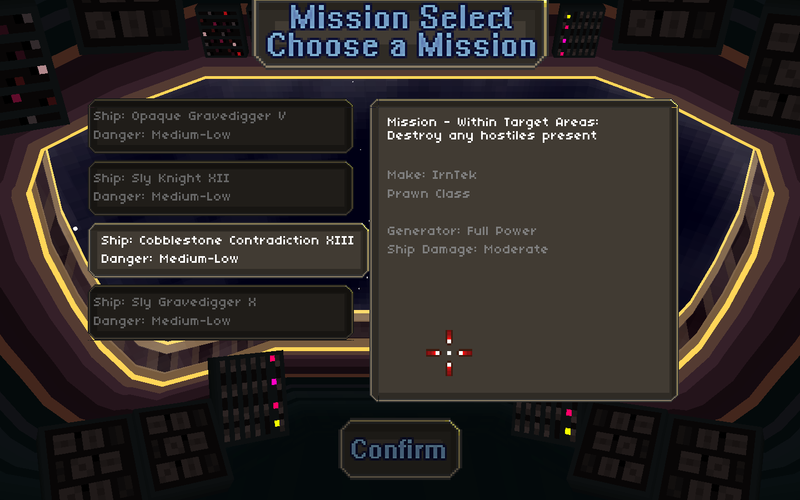 To begin with these missions seem varied, especially when combined with other aesthetic parameters such as ship damage and whether or not the power is still on, but you'll soon identify which offers the best reward to match your playing style and most likely pick the same type over and over again (the toxic ships are particularly challenging in comparison to the other mission types). Of course it would be a rather dull affair if the derelict craft were devoid of hostile life, but thankfully PSC delievers a decent range of resistance; vicious aliens, marauding droids, gun turrets, braindead space zombies and huge boss enemies are all present onboard and determined to spill your mercenaries entrails across the deck. They're pretty tough too (especially on the higher difficulty missions) and the boss battles are suitably epic encounters, but nothing that your collection of grenades can't handle. 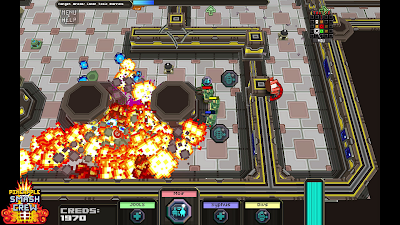 Each of your four mercs can hold a single grenade type and you swap between them by simply selecting the lead soldier out of the group via the mouse wheel (or Q/E on the keyboard). 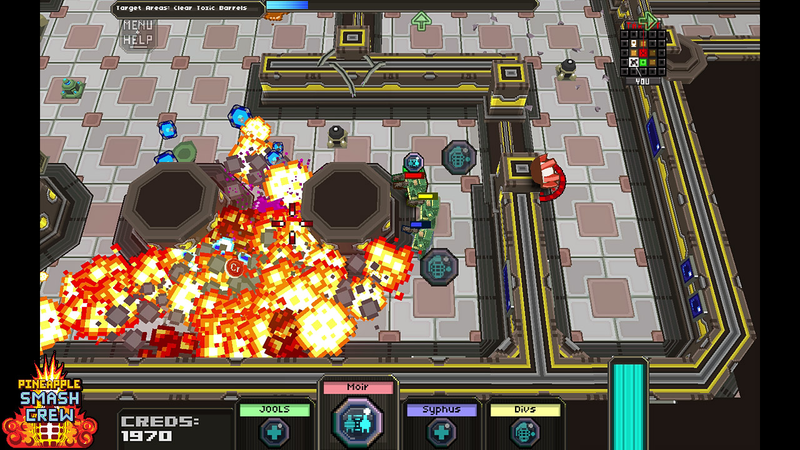 In order to succeed some tactical play is required; there's no point in picking up loads of grenades of the same type when you can hold a mix of offensive and defensive weapons to be utilised in battle. And as mentioned previously, they are extremely well designed and massively satisfying to use - in fact when you get used to the system you'll be questioning why on earth it hasn't been done before. However, unfortunately the quality here just makes the few minor issues that I have with the rest of the game stand out that much more. I bought the Steam version and was surprised to discover that the game was sold with no documentation (and the in-game help sadly doesn't cover all aspects of the game, leaving a fair amount for you to work out on your own), no intro sequence or background story and no achievements. There's no online or offline high score table, and in fact at the time of writing the game doesn't even have an icon in my Steam game library. Then there's the total lack of control options (and this game is just screaming out for dual-analogue joypad or 360 controller support). But more than anything, the game just needs a bit more variety; before long, regardless of the fun to be had in the initial hour or so, it just starts to feel a little too samey too soon. Also, there are other aspects of the game that feel like missed opportunities. 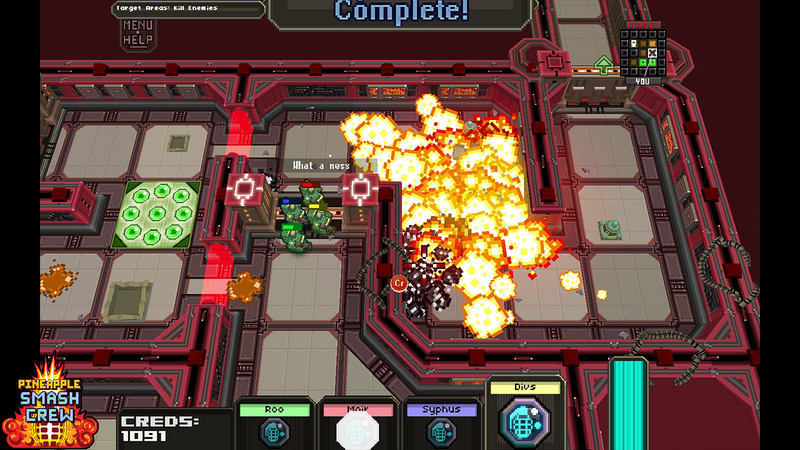 Each ship is laid out as a map of square arena-like modules that are connected in a pattern shown on the map grid in the top-right corner of the screen. Target rooms are clearly labelled, and then there is also a computer room on each ship from which you collect fragments of the Mothership co-ordinates (by way of a percentage). Upon encountering a computer for the first time and seeing the 'access console' message pop up I immediately expected a spoof Intex Systems screen to open a la Alien Breed, but what is this? A single black window containing tiny text giving some details about the origins of a space war that's not been mentioned anywhere else in the game so far? No shop in which to spend my credits? Is this the way that the game expects you to learn about the universe in which PSC is set? Well, colour me underwhelmed. Some sort of encyclopaedia of entries that are unlocked and viewable from within the main menu would have worked better - who wants to read a screen of faux-history during the middle of a fire-fight? That's one sure way to break the flow of an arcade game. More variety in ship textures and furniture (those crates and tanks soon become old), a few more alien types exclusive to certain missions and perhaps even some infrequent random encounters or events would make a huge difference. As it stands, PSC gives away all it's surprises too early - apart from the later grenade types (that take time to earn), you've seen all the game has to offer in the first hour. PSC's promise of almost infinite variations of spacewreck is true to a point; it's just let down by the fact that these infinite variations are just too similar. I'm genuinely sorry that this honest review sounds a little harsh - especially considering that PSC is a two-man production that has clearly been a labour of love. However, for the introductory Steam price of £6.29, I can only recommend the game in it's current state to fans of the genre or to those of you who are only looking for a few hours of explosive old-school gameplay and not the endless variety that the blurb promises. Rich has mentioned that he plans to add extra content to the game over the coming months, and as a customer myself I really hope that this comes to fruition. 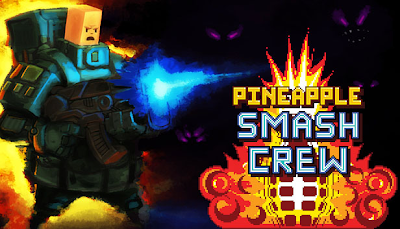 Pineapple Smash Crew is a unique game with huge potential, sadly let down by a lack of variety when it comes down to anything non-grenade related. Buy the game from the links available here (from the Rich Make Game's website). "the goal of the game is to loot an endless battlefield full of alien-infested spacewrecks in order to ultimately retrieve the co-ordinates of a lost Mothership bursting with enough wealth to set you up for life." I'm guessing an opening movie showed that... does it have a end movie showing the soliders languishing in their rewards? Nope :( - No opening intro movie and no fancy end sequence either. That was simply my interpretation of the game from playing it (and of course the website/steam store blurb).